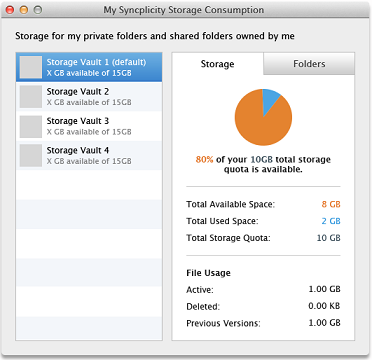 Like a disk drive, you have a limited amount of space associated with your Syncplicity account. This space may be physically allocated from one location or multiple locations. The storage you use consists of the folders and files, both private and shared, owned by you. It does not count the size of folders shared with you but owned by someone else. Once you have used all your storage, you can no longer upload files. 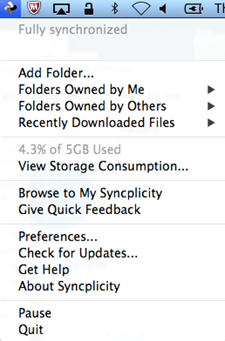 You can monitor your storage in the Syncplicity taskbar and in the View Storage Consumption option. 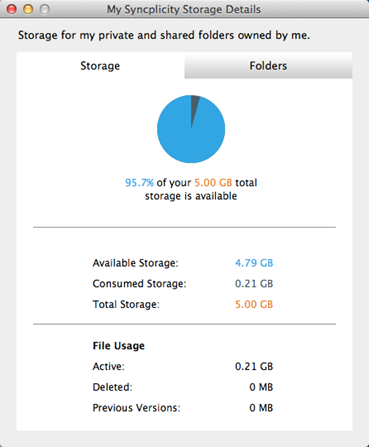 When you open the Syncplicity taskbar, you can view the percent storage consumed from the total available storage. If your administrator has allocated space to you in multiple locations, the Storage tab includes a list of locations. The Storage tab provides details on how much space is used by your active files, deleted files, and previous versions of those files. If you have space in multiple locations, click on each location to see the space used and available in that location. You can click the Folders tab to see the folders stored in that location. Once you have used your allocated storage, you and users accessing your shared folders will not be able to upload files. Should users attempt to upload a file to a shared folder with no space, they see a no more space message along with a button that they can click to email you and inform you of the problem. If using the Enterprise Edition or Business Edition, contact your administrator. If using the Syncplicity Personal Edition, you may need to upgrade your account which you can do from the web, as described in the My Syncplicity Account info and profile article. If your deleted files use a significant amount of space, permanently delete the folder containing the files as described in the Deleting a folder article. You can also permanently delete specific files in the web client as described in the My Syncplicity Working with files article. If you have multiple storage locations and plenty of storage in a different location, consider creating a new shared folder which automatically uses a location where you have space. You can then share files from there.